Sometimes to debug issues related to our plugins, it’s necessary for us to access your website settings. While we rarely ask for access to your website, in the event we do ask for this information, we will always keep your information safe, and will only ever use your information to help fix the problems you are having. However, it’s still worth keeping your website safe in the way we describe below. While sharing your own login details can be risky, a safer alternative would be to create a temporary admin account. Ideally, the admin account would be time-limited, removing itself after a week or so, and not be able to edit users (so that the master admin account stays active). Thankfully there’s a plugin that does just this. The Temporary login with password allows you to quickly create temporary accounts, that will automatically expire – keeping your website’s data safe. Go to the WordPress plugin admin, and add a new plugin. Search for ‘Temporary Login Without Password’, and install then activate the plugin made by StoreApps. 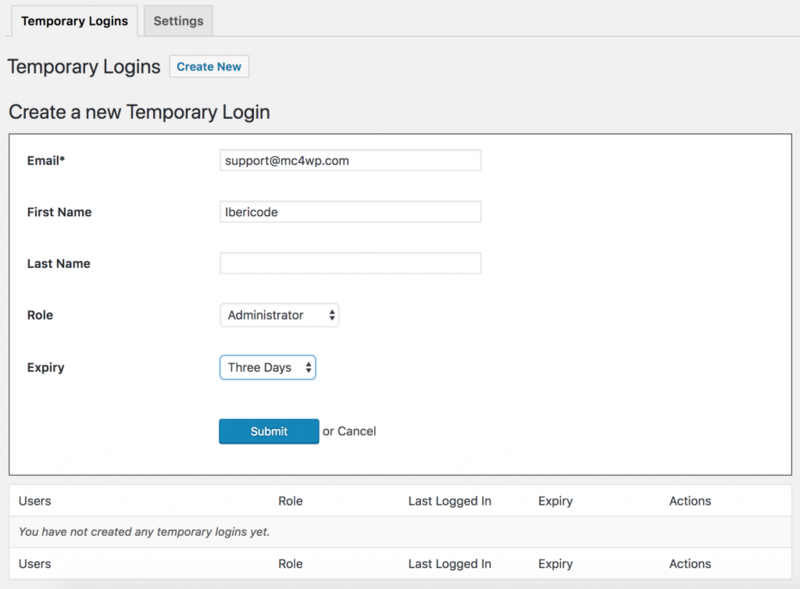 Once active go to the Users > Temporary Logins page. From here you can create new temporary users. Click ‘Create New’ and enter an email address (for support from us use support@mc4wp.com). We recommend using the Admin level, and a week for the duration. A lower level will mean we can’t change all of the theme settings, and a shorter duration means we may not be able to fix any further issues that arise (or you will need to create more accounts). Once the account has been created you will be given a copy of the login link which you can send to us via support@mc4wp.com.